I went in on Friday. On Monday the inspectors thought proper to place some confidence in me—they put the women prisoners under my command, which command I received with reluctance, but was pleased, nevertheless, with this mark of distinction. I should be wanting in my duty, if I passed by, without making known to the public the attention with which I was treated—they seemed to try to make me happy. After I had received my orders from Thomas Eddy and John Murray (1), I was desired by them to make a choice of a room for myself, and a person to attend me. My provisions were sent me from the head keeper’s table. I lived well, and was used well in every respect; but still, in the solemn midnight hours, when all my family [the other prisoners] were asleep, instead of taking rest, I would walk the lonely hall, and view those dreary cells wherein I was confined from the world—and for what, I knew not. . . . . I had the privilege of walking in the yard and garden, which made my time pass with universal approbation. I heard no complaints, and parted with them [the prisoners] in friendship. After delivering up every thing I had in charge, I took my leave, and went before the inspector, who gave me ten dollars. I am not mistress of language to express my feelings on going out of the gate. I came out alone. . . . It is striking that in the space of a weekend, Elizabeth’s treatment, even though she “behaved bad for a few days,” suddenly improved dramatically. Surely even tenuous connections in high places had something to do with that. On 3 June 1806, she was pardoned “being represented unto us as a fit object of our mercy”(2) by Governor Morgan Lewis (1754-1844), who was not only an old friend of John Jay but a relation by marriage. 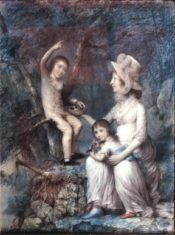 In 1810, Elizabeth Munro Fisher (1759-c.1812) self-published her memoirs, in which she related, often in harrowing detail, her unhappy childhood; her abandonment by her father after she refused the marriage he had arranged for her; her subsequent unhappy marriage to a tailor, Donald Fisher; her trials during the Revolutionary War, her apparently fairly successful life in Canada; and her futile attempt to return to the property near Albany, New York she had been promised by her father. Elizabeth, writing for an audience who, she hoped, would be sympathetic to her plight, did not shrink from describing mean-spirited or nasty things she had done, but she was desperately scrambling to be independent, and for that she needed property. As a feme covert, a married woman, she had no financial independence; any property she had was under the husband’s control. 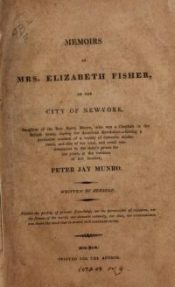 Estranged from her children in Canada, Elizabeth Munro Fisher resided in various places in New York; she is listed in the City Directory in 1806 as “Fisher, widow 9 Magazine”; 1808-1810 as “Fisher, widow Elizabeth 2 West”; and in 1812, “Fisher, Elizabeth widow 92 Mott.” Also listed that year is her daughter: “Fisher, Eliza M. school 118 Chapel.” In 1813 and 1814 only Eliza M. Fisher is listed, after which date, her mother having died, she probably moved back to Canada. From the sparse documents(3) that remain, it is clear that Rev. Harry Munro, having fled America in 1777 for Scotland, was a manipulative and vengeful man. His promise to his daughter to give her the 2,000 acres at Hebron, New York, as Elizabeth related, was spurious, as he knew the property would then be under the husband’s control. 1. 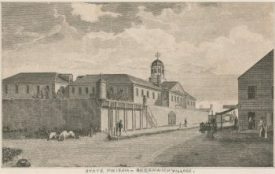 Thomas Eddy (1758-1827) and John Murray (1737-1808), Quakers, were members of the commission appointed to build the state prison with a single cell system in Greenwich Village (1797). They both were involved in philanthropic and social reform projects in NYC. 2. New York State Archives Executive Pardons 1799-1931, B0042-78. 3. See the Munro Papers at the Archives of the Museum of the City of New York and the New York State Archives in Albany. 4. Albany, N.Y. State Archives, John Chambers Papers, Box 2, CP 9885 #93-198 9885-93-99; 9885-141-143; also HY 12382 John Williams Papers, Box 2, Folder 8, Legal Papers SC12382. The illustration is the cover of Memoirs of Mrs. Elizabeth Fisher, of the city of New-York, daughter of the Rev. Harry Munro, who was a Chaplain in the British Army, during the American Revolution.—Giving a particular account of a variety of domestic misfortunes, and also of her trial, and cruel condemnation to the state’s prison for six years, at the instance of her brother, Peter Jay Munro. The original is at the Library of Congress. ELIZABETH FISHER stated “she is not guilty thereof.” The brown-haired widow, 41 years old and standing 5 feet 2¾ inches tall, had been arrested by Albany County Sheriff on a complaint by her half-brother Peter Jay Munro on 27 October 1800. She had been in jail since then. At her trial by jury on 10 March 1801, the district attorney produced a 28-year old farmer, as Elizabeth wrote in her Memoirs, “a man by the name of John Nira Smith to my utter astonishment, swore that he saw that deed executed in Ruport [Rupert, north of Bennington], in the State of Vermont, by Adonijah Crane. This evidence, being so pointed,” Fisher, according to court records, “nothing further saith.” According to 18th century rules of evidence, the accused in a criminal case could not take the stand, even on her own behalf, thus Elizabeth Fisher was sentenced to life at hard labor in the State Prison in New York City. So was Smith. How had Elizabeth Munro Fisher’s life come to such a pass? After all, she was the daughter of an Episcopalian minister and Loyalist Rev. Harry Munro (1730-1801), and the half-sister of the New York lawyer Peter Jay Munro (1766-1833), who, in turn, was the nephew of the New York governor, John Jay. In the next post: What became of Elizabeth Munro Fisher? [J2911-82;A52/6], NYS Archives, Albany, NY. 2. Memoirs of Mrs. Elizabeth Fisher, of the City of New York, Daughter of the Rev. Harry Munro, who was a Chaplain in the British Army, during the American Revolution-Giving a particular account of a variety of domestic Misfortunes, and also of her trial, and cruel condemnation to the state’s prison for six years, at the instance of her brother, Peter Jay Munro. Written by herself. New York: Printed for the Author(c.1810). 3. The Selected Papers of John Jay, Elizabeth M. Nuxoll, Ed., vol. 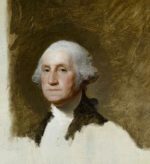 5: 1788-1794 (Charlottesville: U. of Virginia Press, 2017), pp. 425-26. The illustration is of the New York State Prison in Greenwich Village.